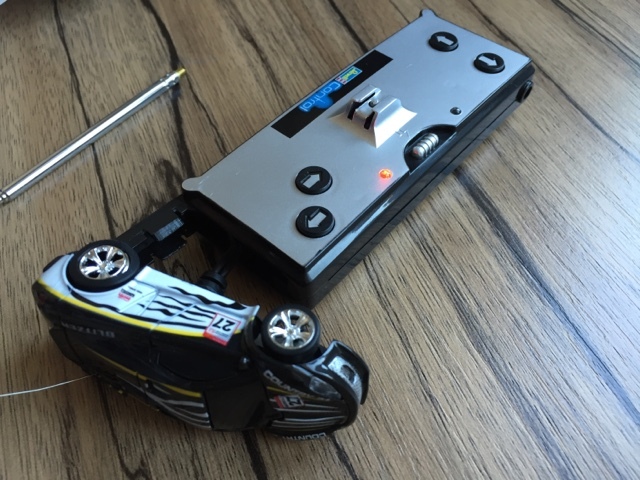 I have been away travelling for a while, and this has stopped me getting my fix of RC fun. Luckily I popped in to get an exotic snack (Curry wurst) and noticed that there were a few toys by the counter including these Revell RC Cars in a can! As strange as it sounds the RC car in a can concept has been around for a while. Although these look much smaller scale than the ones that were popular a few years ago. As these cars were only 6 euros I was definitely going to get one. All I had to do was to pick my favourite body design amongst the range and take it to the till. I was keen to get back to my hotel room and put this little car through its paces. Although first I had a Currywurst to attend to... yum! When I got back to the hotel, I opened the can and quickly emptied out the out the contents. 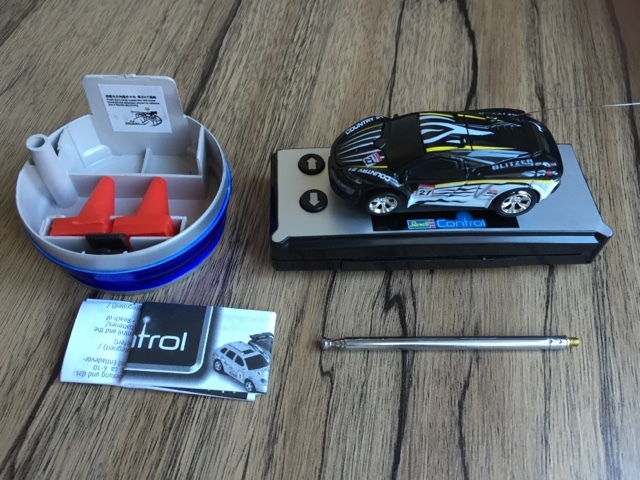 The package contains the car mounted on the controller which in-turn also combines its functionality as a charger. There is also an aerial and 4 little cones that you can place around to create a makeshift circuit. First up I popped the two AA batteries into the main controller. And then tried to remove the car from the control unit. In theory you just need to press down the release button on the controller and slide the car off backwards. I'm usually good at pressing buttons! In reality it was not that simple, the car felt quite stuck on there but with a little wiggle and significantly more elbow grease it came off. Here I could take a good look at the car. 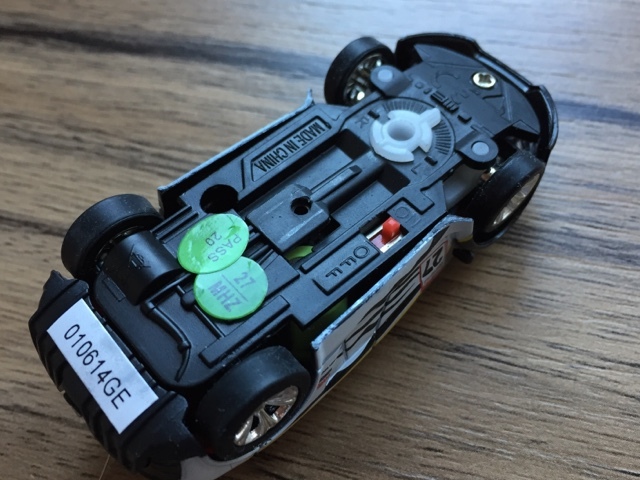 The size is around that of a die-cast hotwheels toy and whilst the shell is generic and not a licensed design there is a lot of detail on the body. The cool body is also backed up with nice alloy wheels with rubber tyres. When you flip the car over you can see that there is a basic steering trim that you can adjust if the car doesn't run straight. There is also the charge port and the on/off switch. The charge cable for the car is hidden in a side compartment in the main transmitter. You just need to ensure the car is switched off, then plug the cable into the cars charge port. This triggers a red light and once the red light switches off the car is fully charged. It only takes around a couple of minutes to charge. A new circuit in Germany! I screwed in the aerial and made a quick circuit with the cones and took it for a spin. 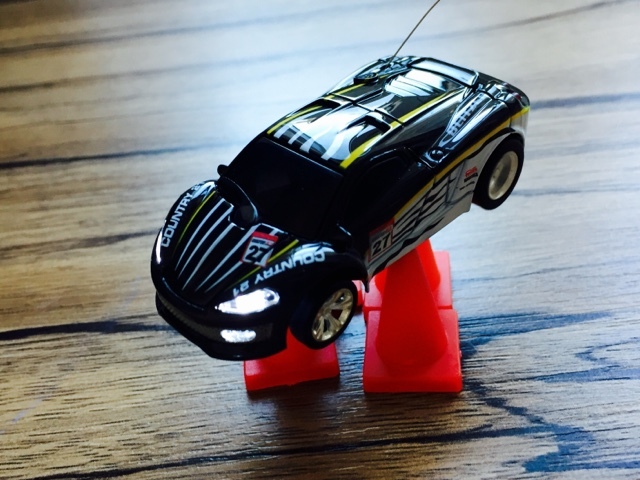 The car has full functionality but as you would expect there is no proportional control. So there is not much finesse in the controls, but then what would you expect for the price. The car zips along at a reasonable pace for its size. Both the rear wheels drive the car with a locked rear axle, so it can move around on the short carpet in the hotel room comfortably. The steering arc is quite large but if you come off the throttle it reduces the under steer. It soon didn't take long before I was performing a figure of eight through the cones quite comfortably. One of the things that did surprise me when the car moves is that it has front and rear lights. Front lights come on when you drive forward and rear when you reverse. Its a simple thing but it looks pretty good and makes this little car a bit more cool. One thing that is very poor is the range. After about 1.5m the reception for the car starts to stutter. At first I thought that I had not screwed in the transmitter aerial enough, however after several attempts it still was patchy once the car was any meaningful distance away. I know it's just a toy, but it is quite a small distance. The battery soon runs out, and after 3 mins or so it's time to put it back on charge. It is a short run time, and it almost reminds me of when I used to race with 1200mah Ni-cads :) however it is quick to charge the car up again. I popped the little car in my bag and a few of us messed about with it when waiting for meetings or even when on a bar waiting for a drink. For a few euros the car did exactly what I wanted it to do. It raced around and let me get a 'mild' rc fix when I have been away from the track for too long.